Looking for something a little different for a Valentine's Day treat? Chocolate Almond Biscotti may be just the thing. Long, crunchy cookies with a rich chocolate flavor are made to be savored slowly over a cup of coffee or tea. Biscotti have been around for a long time. Centuries ago, they were originally made as a”long-shelf-life” food (very dry and containing no fats) for travelers and were carried by the Roman Legions to battle. Today’s biscotti, while still hard and crunchy, are a far cry from the original, and are a popular accompaniment to espresso, cappuccino, and dessert wine. Their unique texture makes them perfect to dunk in your morning coffee, afternoon tea, or wine after dinner (History of Biscotti). These are also the perfect cookie to send through the mail if your Valentine is far away. You still want to pack carefully, of course, but they are very sturdy. 1. Preheat oven to 350 degrees, and place rack in the middle. Line a half sheet (18x13; mine is 16X11) cookie sheet with parchment paper. 2. In a medium bowl, sift together the flour, cocoa powder, soda, and salt. Set aside. In a large bowl, beat 3 eggs, sugar, vanilla, and almond extract (if using). Gradually stir dry ingredients into egg mixture. Mix just until combined. 3. Mix almonds and chocolate chips into dough until mixed throughout and dough holds together. Dough will be very stiff. 4. On a lightly floured surface, divide dough in half. With slightly wet hands, pat dough into rectangles, slightly rounded on top, about 1" to 1.5" thick. Place rectangles on prepared cookie sheet. 5. Mix the one egg that is left with 2 teaspoons of water and whisk until well combined. Brush the tops of the dough rectangles lightly but completely with egg mixture, then sprinkle evenly with sparkling sugar. 6. Bake for about 25 minutes, or until dough feels firm to the touch, especially center tops. Remove sheet from oven and let cool on rack for about 20 minutes, or until cookie rectangle can be handled comfortably. Turn oven down to 325 degrees. 8. Place the biscotti cut side down on the cookie sheet and bake at 325 degrees for about 25 minutes, turning cookies over halfway through baking time. Cookies should be firm and dry, but not browned. 9. Remove from oven and let cool on cookie sheet for 5 minutes, then on cooling rack until completely cool. Store tightly covered. These keep well for several days. Makes about 24, depending on how you cut them. Chocolate Almond Biscotti may have been taken to some of these fun parties! Double yum! Hope to see you at Funtastic Friday this week. Your recipes always look amazing! You are not only a terrific cook but you take mouth watering pictures. This biscotti looks extremely delicious. I love the chocolate and coffee together. I love biscotti! Beautiful pictures, Joy! That sounds delicious. And, you made it seem easier than I thought it would be! Thanks for the recipe. Looks delicious and this caught my eye over at Pieced Pastimes because I have the same Mikasa dishes. Your photos are beautiful! These look great! I'm hoping to be able to try them soon as a perfect Valentine's Day gift for my daughters. Sounds delightful! Thanks for linking up to Scraptastic Saturdays. Yummy! I need to try this! Wow, these look so yummy! I've made a few different kinds of biscotti over the years but not this one....YET! Your biscotti does look delicious! I love dipping it in coffee but then I am a sugar junky! Hello! Nice post and photos! YUM! I've been craving biscotti, but never thought to use chocolate in it. Saving this recipe for later! 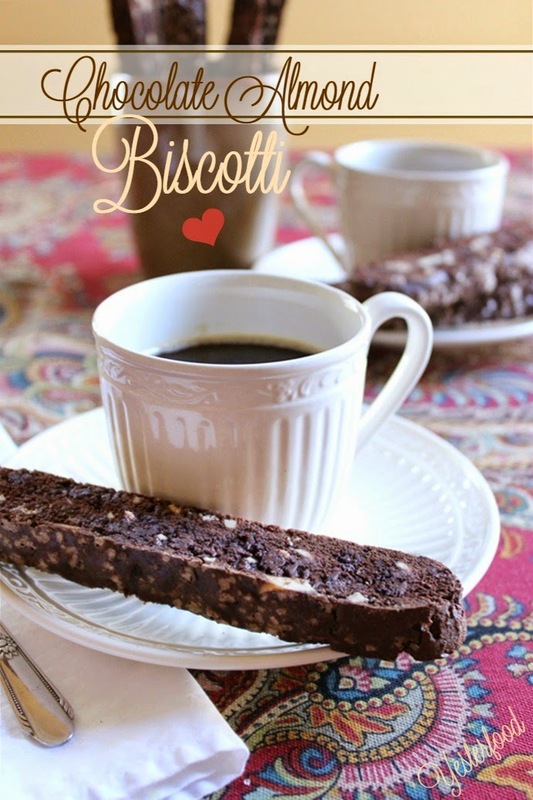 Yum…love biscotti with coffee and chocolate sends it over the top! Yum, those look delicious Joy!! I didn't realise biscotti dated back to the Romans, Joy! I was so interested to learn that. 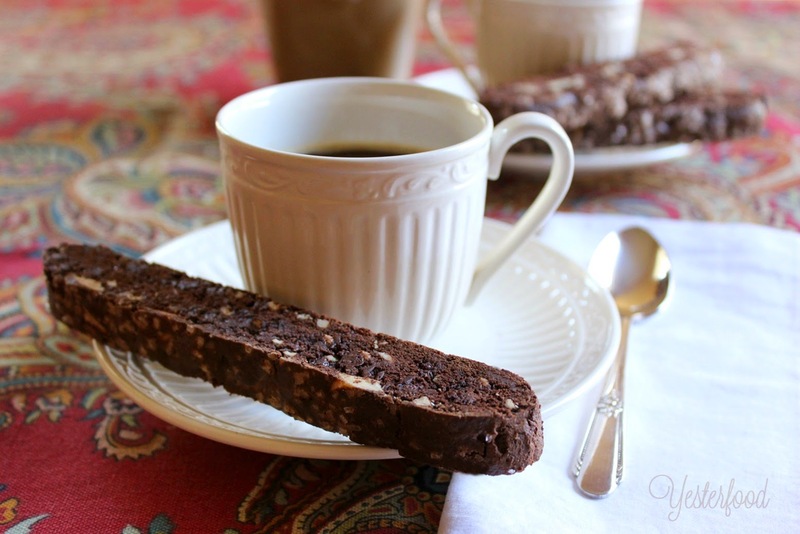 Your Chocolate Almond Biscotti look lovely - the perfect Valentine's Day treat! Thank you for sharing them with us at the Hearth and Soul hop. Looks pretty and I am sure it tastes delicious Joy! Thanks for sharing with SYC. Love biscotti, oh, chocolate. Thanks for linking up to Funtastic Friday. Hope to see you again soon. Hi Joy!, Theresa from Shoestring Elegance and the What to do Weekend’s Party. I just wanted to pop by and tell you that I just Featured your Beautiful Biscotti over @ the party! Come grab your Featured button and thank you for linking up with us! Hugs to you, my dear! The biscotti looks amazing! And I really love the history you shared of it at the beginning. Sometimes us women need to take some chocolate into battle too :) Thanks for sharing this on the Art of Home-Making Mondays this week! Mmmm...this looks so yummy! 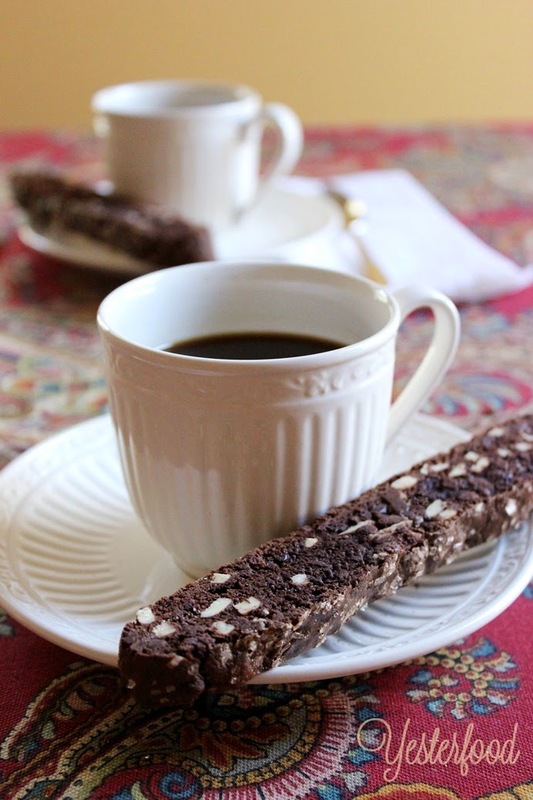 I love chocolate and almonds together AND as a biscotti! Yes, Please! I love Biscotti and perfect for afternoon tea. Thanks so much for sharing your awesome post with Full Plate Thursday, I will be pinning this. Hope you have a great week and come back soon! Did you know you can shorten your links with Shortest and get cash for every click on your short links.